Viswanathan Anand (Tamil: விஸ்வநாதன் ஆனந்த்; born 11 December 1969) is an Indian chess Grandmaster and the current World Chess Champion. Anand has won the World Chess Championship five times (2000, 2007, 2008, 2010, 2012), and has been the undisputed World Champion since 2007. Anand was the FIDE World Rapid Chess Champion in 2003, and is widely considered the strongest rapid player of his generation. Anand became India's first grandmaster in 1988. He was also the first recipient of the Rajiv Gandhi Khel Ratna Award in 1991–92, India's highest sporting honour. In 2007, he was awarded India's second highest civilian award, the Padma Vibhushan, making him the first sportsperson to receive the award in Indian history. Anand has won the Chess Oscar six times (1997, 1998, 2003, 2004, 2007, 2008). Viswanathan Anand was born on December 11, 1969 in Mayiladuthurai, a town in Tamil Nadu. Shortly thereafter, his family moved to Chennai (formerly Madras), where he grew up. His father, Viswanathan Iyer, is a retired General Manager of Southern Railways, and his mother Susheela, housewife and chess/film/club aficionado and an influential socialite. He has an elder brother, Shivakumar who is a manager at Crompton Greaves in India and an elder sister Anuradha who is a professor at the University of Michigan. Anand is 11 years younger than his sister and 13 years younger than his brother. I started when I was six. My mother taught me how to play. In fact, my mother used to do a lot for my chess. We moved to the Philippines shortly afterward. I joined the club in India and we moved to the Philippines for a year. And there they had a TV program that was on in the afternoon, one to two or something like that, when I was in school. So she would write down all the games that they showed and the puzzles, and in the evening we solved them together. Of course my mother and her family used to play some chess, and she used to play with her younger brother, so she had some background in chess, but she never went to a club or anything like that. So we solved all these puzzles and sent in our answers together. And they gave the prize of a book to the winner. And over the course of many months, I won so many prizes. At one point they just said take all the books you want, but don't send in any more entries. In August 2010, Anand joined the Board of Directors of Olympic Gold Quest, a foundation for promoting and supporting India's elite sportspersons and potential young talent. On 24 December 2010 Anand was guest of honour on the grounds of Gujarat university, Ahmedabad, where 20,486 players created a new world record of simultaneous chess play at single venue. His hobbies are reading, swimming, and listening to music. He is married to Aruna Anand and has a son born on 9 April 2011. Anand's son is named Akhil and in the Tamil tradition will be called "Anand Akhil" (no surname). Briefly, Anand lived with his wife Aruna in Spain. The family is now based in Chennai, India. Anand has been regarded as an unassuming person with a reputation for refraining from political and psychological ploys and instead focusing on his game. This has made him a well-liked figure throughout the chess world for two decades, evidenced by the fact that Garry Kasparov, Vladimir Kramnik, and Magnus Carlsen, of whom the former two were rivals for the World Championship throughout Anand's career, each aided him in preparing for the World Chess Championship 2010. Anand is sometimes known as the "Tiger of Madras". Anand was the only sportsperson to have been invited for the dinner hosted by the Indian PM Manmohan Singh for US President Barack Obama on 7 November 2010. Anand was denied an honorary doctorate from University of Hyderabad because of confusion over his citizenship status; however, later Kapil Sibal, India's Minister of Human Resource Development apologized and said "There is no issue on the matter as Anand has agreed to accept the degree at a convenient time depending on his availability". According to The Hindu, Anand finally declined to accept the doctorate. Anand's rise in the Indian chess world was meteoric. National level success came early for him when he won the National Sub-Junior Chess Championship with a score of 9/9 in 1983 at the age of fourteen. He became the youngest Indian to win the title of International Master at the age of fifteen, in 1984. At the age of sixteen he became the national chess champion and won that title two more times. He played games at blitz speed. In 1987, he became the first Indian to win the World Junior Chess Championship. In 1988, at the age of eighteen, he became India's first Grandmaster by winning Shakti Finance International chess tournament held in Coimbatore, India. He was awarded Padma Shri at the age of 18. "Vishy", as he is sometimes called by his friends, burst upon the upper echelons of the chess scene in the early 1990s, winning such tournaments as Reggio Emilia 1991 (ahead of Garry Kasparov and Anatoly Karpov). Playing at such a high level did not slow him down, and he continued to play games at blitz speed. In the World Chess Championship 1993 cycle Anand qualified for his first Candidates Tournament, winning his first match but narrowly losing his quarter-final match to Anatoly Karpov. In the 1995 PCA cycle, Anand won matches against Oleg Romanishin and Michael Adams without a loss, then avenged his FIDE loss by defeating Gata Kamsky in the Candidates final. In 1995, he played the PCA World Chess Championship 1995 against Kasparov in New York City's World Trade Center. After an opening run of eight draws (a record for the opening of a world championship match), Anand won game nine with a powerful exchange sacrifice, but then lost four of the next five. He lost the match 10½–7½. In the 1998 FIDE cycle, the reigning champion Karpov was granted direct seeding by FIDE into the final against the winner of the seven-round single elimination Candidates tournament. The psychological and physical advantage gained by Karpov from this decision caused significant controversy, leading to the withdrawal of future World Champion Vladimir Kramnik from the candidates tournament. Anand won the candidates tournament, defeating Michael Adams in the final, and immediately faced a well-rested Karpov for the championship. Despite this tremendous disadvantage for Anand, which he described as being "brought in a coffin" to play Karpov. The regular match ended 3–3, which lead to a rapid playoff, which Karpov won 2–0. Karpov thus remained the FIDE champion. After several near misses, Anand won the FIDE World Chess Championship in 2000 for the first time after defeating Alexei Shirov 3½–0½ in the final match held at Tehran, thereby becoming the first Indian to win that title. In September 2007 Anand became World Champion again by winning that year's FIDE World Championship Tournament held in Mexico City. He won the double round-robin tournament with a final score of 9 out of 14 points, a full point ahead of joint second place finishers Vladimir Kramnik and Boris Gelfand. Prior to the World Chess Championship 2010 match with Veselin Topalov, Anand, who had booked on the flight Frankfurt-Sofia on 16 April, was stranded due to the cancellation of all flights following the volcano ash cloud from Eyjafjallajökull. 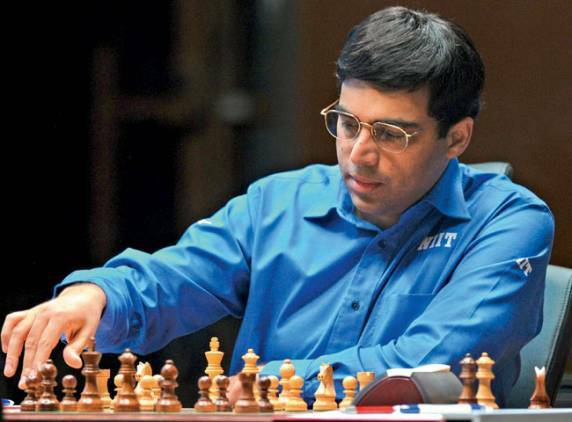 Anand asked for a three-day postponement, which the Bulgarian organisers refused on 19 April. Anand eventually reached Sofia on 20 April, after a 40-hour road journey. Consequently, the first game was delayed by one day. The match consisted of 12 games. After 11 games the score was tied at 5½–5½. Anand won game 12 on the Black side of a Queen's Gambit Declined to win the match and retain the World Championship. In game 12, after Topalov's dubious 31st and 32nd moves, Anand obtained a strong attack against Topalov's relatively exposed king. Topalov subsequently resigned. As a result of Anand's victory in the World Chess Championship 2010, he defended his title in the World Chess Championship 2012; the location of the event was the Tretyakov Gallery in Moscow. His opponent was Boris Gelfand, the winner of the 2011 Candidates Matches. The match was tied 6–6 after regular games with one win each. Anand won the rapid tie break 2½–1½ to win the match and retain his title. After losing in the 7th game to Gelfand, Anand came back to win the 8th game in only 17 moves – the shortest game in World Chess Championship history. After the match Russian president greeted Anand and Gelfand by calling both to his official residence. As a result of Anand's victory in the World Chess Championship 2012, he will defend his title in the World Chess Championship 2013. This time his challenger is Magnus Carlsen, the winner of the 2013 Candidates Tournament. In the 2013 Alekhine Memorial tournament, held from 20 April to 1 May, Anand finished third, with +2−1=6. Anand's recent tournament successes include the Corus chess tournament in 2006 (tied with Veselin Topalov), Dortmund in 2004, and Linares in 2007 and 2008. He has won the annual event Monaco Amber Blindfold and Rapid Chess Championships in years 1994, 1997, 2003, 2005 and 2006. He is the only player to have won five titles of the Corus chess tournament. He is also the only player to win the blind and rapid sections of the Amber tournament in the same year (twice: in 1997 and 2005). He is the first player to have achieved victories in each of the three big chess supertournaments: Corus (1989, 1998, 2003, 2004, 2006), Linares (1998, 2007, 2008), Dortmund (1996, 2000, 2004). In March 2007, Anand won the Linares chess tournament and it was widely believed that he would be ranked world No.1 in the FIDE Elo rating list for April 2007. However, Anand was placed No.2 in the initial list released because the Linares result was not included. FIDE subsequently announced that the Linares results would be included after all, making Anand number one in the April 2007 list. In the April 2007 FIDE Elo rating list, Anand was ranked first in the world for the first time, and (as of July 2008) he held the number one spot in all ratings lists but one since then until July 2008, the exception being the January 2008 list, where he was rated No. 2 behind Vladimir Kramnik (equal rating, but Kramnik held the No. 1 spot due to more games played). He dropped to No. 5 in the October 2008 list, the first time he had been outside the top 3 since July 1996. In 2010, Anand announced that he would expand his tournament schedule, beginning in late 2010, in an effort to regain the world number one ranking from Magnus Carlsen.He achieved that goal on 1 November 2010 list with a rating of 2804, two points ahead of Magnus Carlsen, but was once again overtaken by Carlsen in July 2011.